I have a 2002 Fundeck 196r. I love the boat most of the time. My problem with it is that when the water gets choppy at speeds over 20mph, the ride is very rough on this boat. I kind of knew that going in, but I thought I could live with it. Unfortunately, my wife and kids really complain about the not so comfortable ride. 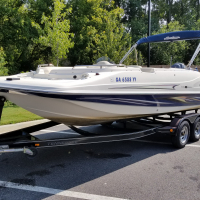 So I've been looking for a different boat in the Hurricane family, specifically a 2006 GS 202. From your experience, will the ride be better (smoother) on this hull or is it even more bumpy? Or is will it be the same? @omar174 ... Don't think there would be a huge difference in ride besides the fact it's a bigger boat. That is four model years worth of hull improvements, however. Sorry I couldn't be more help. Any chance for a test drive? No worries Capt. I think the seller ended up selling the boat anyways. So I'll just keep my Fundeck for now. Got it... Say the word if another pops up on your radar.